I made my husband's day this past weekend, when I surprised him with the "Hey Arnold: The Ultimate Collection" DVD set which hit store shelves back on November 13th. Back when we were dating, he would ask me to record this animated series, which he used to watch with his little brother growing up, so he could watch after work. I always wondered why he liked this show, especially as a grown adult. But, after sitting down to watch a few episodes with him, I could see why he and so many other kids and adults would tune in to watch Hey Arnold! when it aired on Nickelodeon. And, now, my husband has the complete series, thanks to the folks at Nickelodeon, to watch whenever he wants. :-) This past weekend my husband and girls were snuggling on the couch watching a few Hey Arnold! episodes, while I was making my Thanksgiving shopping list and wrapping a few holiday gifts I had picked up for family. By the time the second episode ended, both of my girls were hooked, and asked for more Hey Arnold! :-) And, my husband was not going to say "no" as he was enjoying watching one of his favorite shows of "yesteryear", now with his girls by his side, enjoying it along with him. "For the first time ever, bring home every episode starring Nickelodeon's most famous football head when Hey Arnold! : The Ultimate Collection arrived on DVD back on November 13th. Hey Arnold! 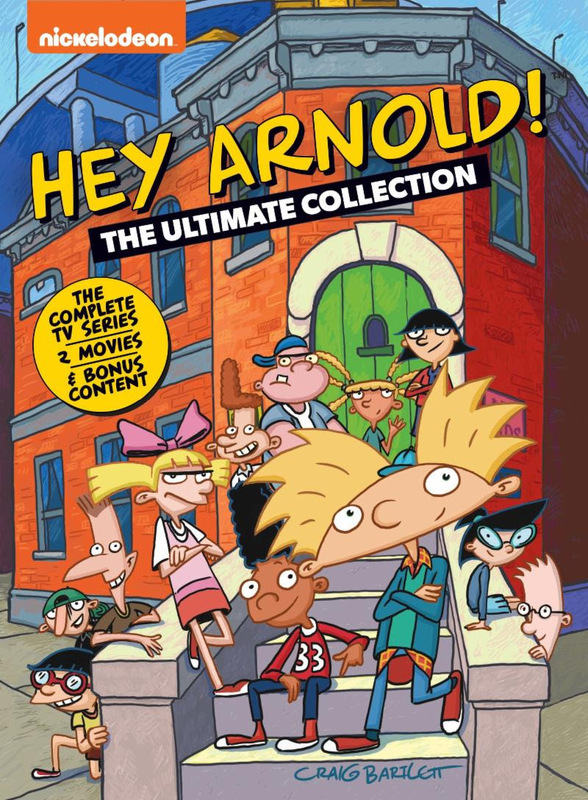 : The Ultimate Collection includes 18-discs with all 100 episodes from the show's original five season run, plus new-to-DVD bonus features and two discs that feature the original films Hey Arnold! : The Movie and Hey Arnold! : The Jungle Movie. For over twenty years, fans of the classic coming-of-age series have remained loyal to Arnold, the relatable kid living with his wacky grandparents in their boarding home, and his group of lovable, city-dwelling friends. With Hey Arnold! : The Ultimate Collection, fans can relive every schoolyard shenanigan in fan-favorite episodes like "Stoop Kid" and "Downtown as Fruits;" laugh along with popular characters Helga, Gerald, Phoebe and more; and finally solve the mystery of Arnold's missing parents in the latest adventure, Hey Arnold! : The Jungle Movie. Produced by Nickelodeon Home Entertainment and distributed by Paramount Home Media Distribution, Hey Arnold! : The Ultimate Collection is available on DVD as of November 13 for the suggested retail price of $50.99. "